'Kaalangalil aval vasatham' - an evergreen song which transports us to celestial bliss whenever heard and the mellifluous, melodious, euphonious and honey-toned voice belongs to none other than P B Srinivas (PBS). One can define PBS as playback singer. A singer who has sung in many languages, including Tamil, Telugu, Kannada, Malayalam and Hindi, and enthralled the listeners and held them captive with his enchanting voice. He is not only a multi-lingual singer but also a muliti-lingual poet. The 78-year-old PBS hails from Andhra Pradesh and has sung almost all the songs for Kannada super star Rajkumar and thus became a 'singer's singer'. Born to the couple Phanindra Swamy and Sesha Giriamma, in Kakinada, Andhra Pradesh, he has completed college with a Bachelors of Commerce degree. His first solo hit came in the movie Prema Pasam in which he also sang a duet with P. Susheela. 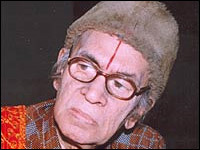 In Pava Mannippu, Sreenivas sang 'Kalangalil Aval Vasantham' written by Kannadasan and set to the tune by the music duo Viswanathan - Ramamurthy. The film 'Adutha Veettuppen' of Anjali Pictures carried some of his songs. Sreenivas has also sung with P.Susheela, S. Janaki, Banumathi, and some North Indian Singers. His devotional songs include Sharadha Bhujanga Stothram, Sri Venkateswara Suprabhatham, Mukunda Mala, Shri Mallikarjuna Stotram and Purandaradasa compositions.